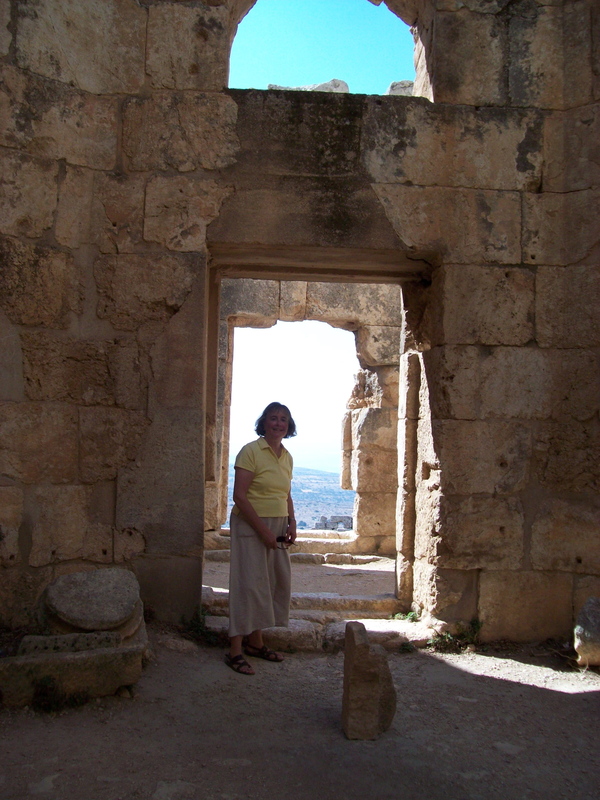 A beautiful and peaceful spot, St. Simeon Stylites near Aleppo. 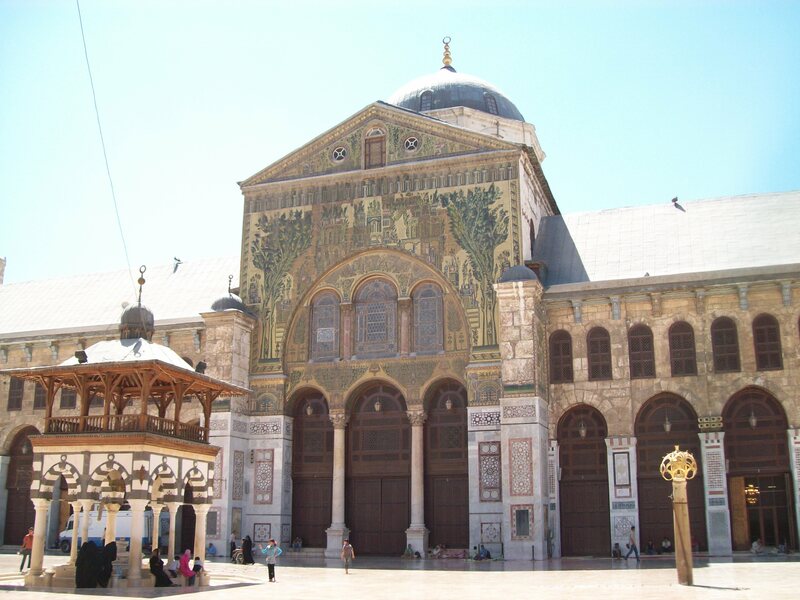 The Grand Umayyad Mosque in Damascus, Syria, as it looked in August, 2010. This is the burial place of Saladin and also perhaps the resting place of St. John the Baptist. 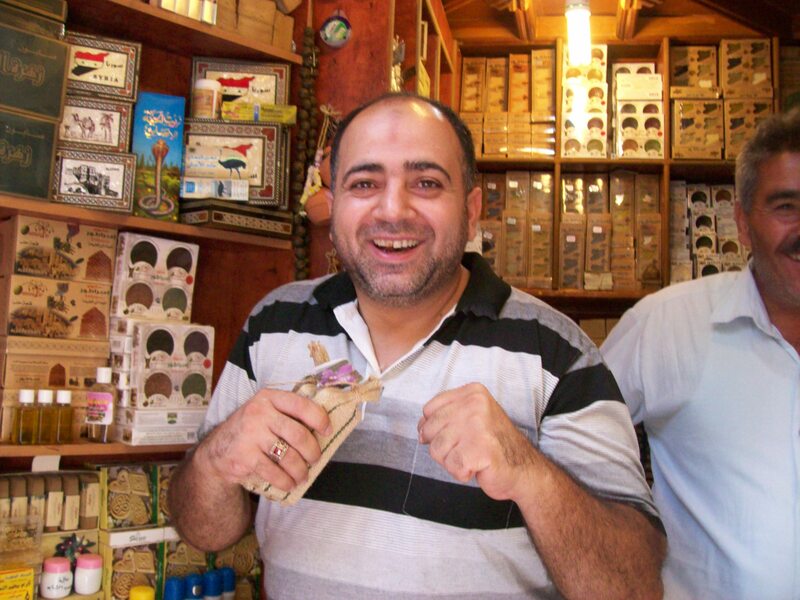 A soap merchant at the souk in Aleppo. This man was an Olympic wrestler. been bombed and burned and is no more. I brought home saffron for Steve from one of the spice vendors. I look at that jar and remember the man who sold it to me. He sat me in his booth, brought me tea and sweets and smiled as he waited for someone to fill my order. Centuries of stories like that simple transaction are now just memories. 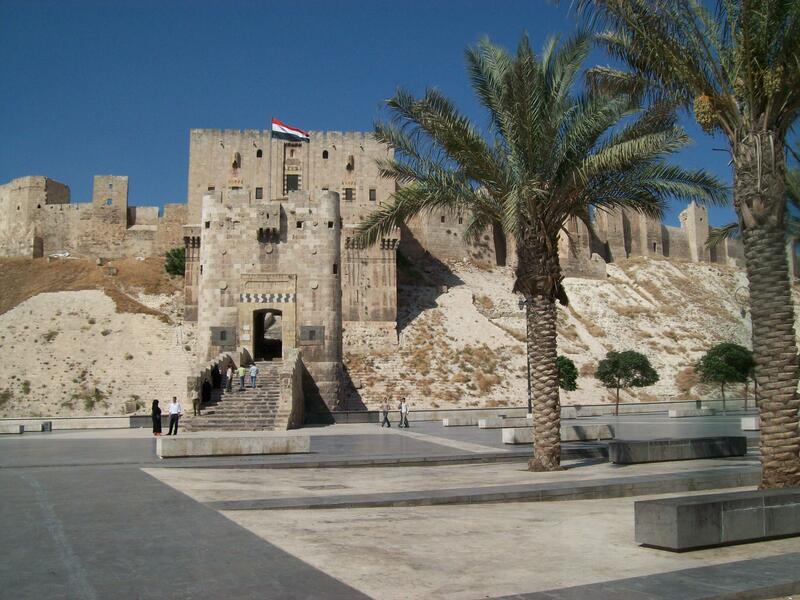 The Citadel, Aleppo, Syria, as it looked in August, 2010, when the faithful women visited. 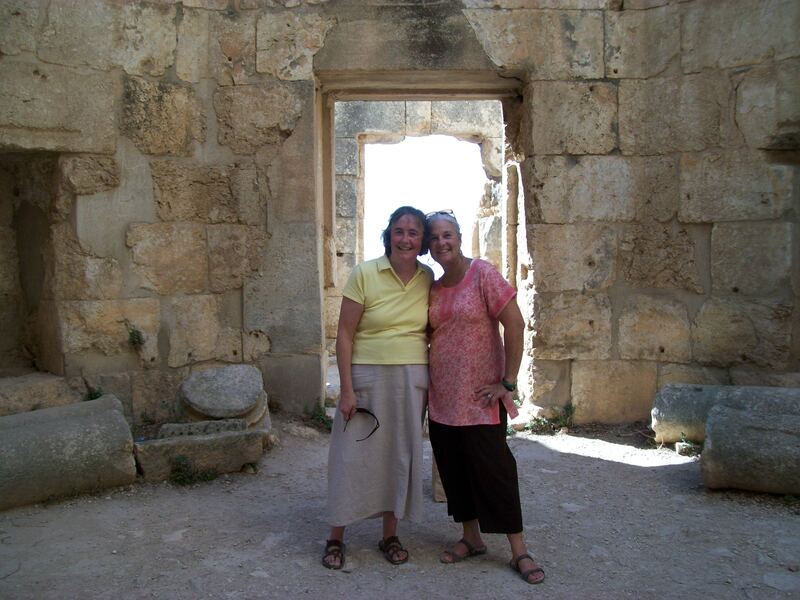 Me and Barbara at St. Simeon near Aleppo. As I read the stories of damage and the people who are working to save what is left, I took heart at their courage and effort to preserve this for others who will live there one day. I also remembered another special site that we visited and wondered if it was still standing. 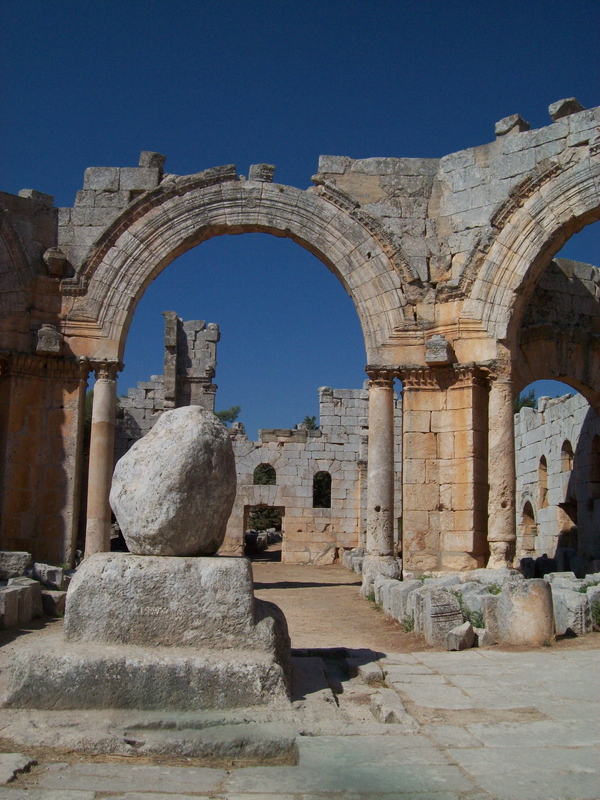 Of course it was ruins when we visited, but the remains of the place will always mark the story of Saint Simeon the Stylite and how he lived out his faith. His story reminds me that Christians walked these lands from the beginning and they are responsible for my being able to hear the good news. He joined a monastery at the age of 16 and disturbed his brothers when he chose to live a very austere lifestyle. He even spent two or three years in a hut by himself, fasting through that Lent – no food or water – and miraculously survived. St. Simeon’s pedestal in the center of the church. He left the confines of the monastery to be alone with God, choosing a solitary existence to deepen his prayer life and relationship with the Lord. People would seek him out for his counsel and help, and to escape all those clamoring after him, he climbed a stone outcropping, large enough for him, but barely. He would spend hours and hours in prayer in awkward, uncomfortable positions, for instance holding his arms out for long periods of time as if crucified like Jesus. His superiors decided to test him in his obedience (and sanity I think) by demanding that he come down. If he was obedient he would submit. And he did. Passing this test, they let him be and his story spread. More came to see him and over the course of years he moved to higher and higher pedestals. It was said when he died, the pedestal was over fifty feet off the ground. He wrote letters, he preached to those gathered below. He prayed. He spent 47 years up there and died September 2, 459. His feast day is celebrated on September 1. Inside the compound at St. Simeon near Aleppo. The Roman emperor was so taken with his faith that a beautiful church was built around his pillar. Four basilicas meet at the center where the pillar stood, and the remnant of which is still there. The remains of that place are what we walked through and explored that hot day in August, 2010. It was so peaceful. You could look for miles in every direction. It was a place where you could feel the closeness and accessibility of God, even without being fifty up on a pillar. 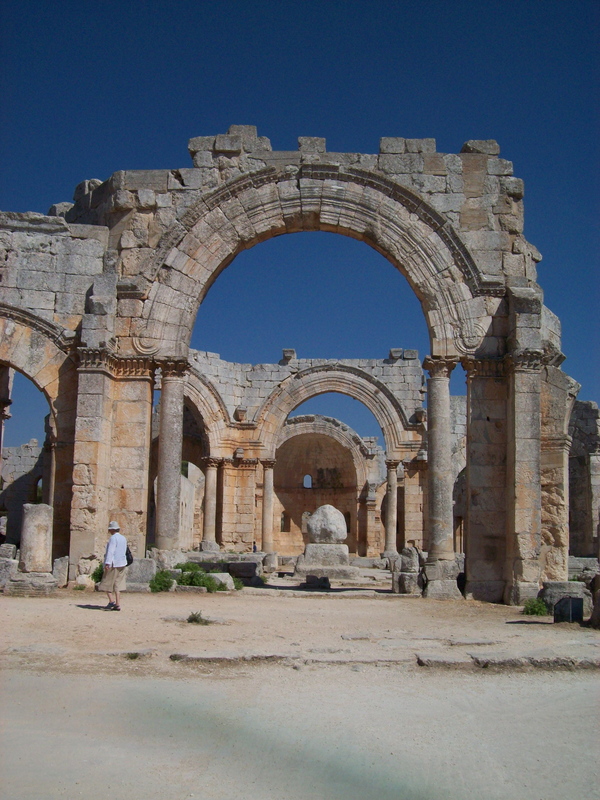 I don’t know what has happened to this place where St. Simeon inspired so many, including other ascetics who followed him and became stylites, needing little but to be close to God. I don’t know what has happened to the family who ran the little gift shop, supplying cold drinks for us on that hot day. I know what I read in the BBC news today and it angers and saddens me. I pray for them all and I hope their courage and fortitude will allow them to continue to preserve and protect this history and these stories so that others may hear and believe. But this I know: Blessed are those who are persecuted because of righteousness, for theirs is the kingdom of heaven.